The Lower Elementary Cottage: Super Scissors for Kids Who Struggle with Fine Motor and Cutting! Super Scissors for Kids Who Struggle with Fine Motor and Cutting! 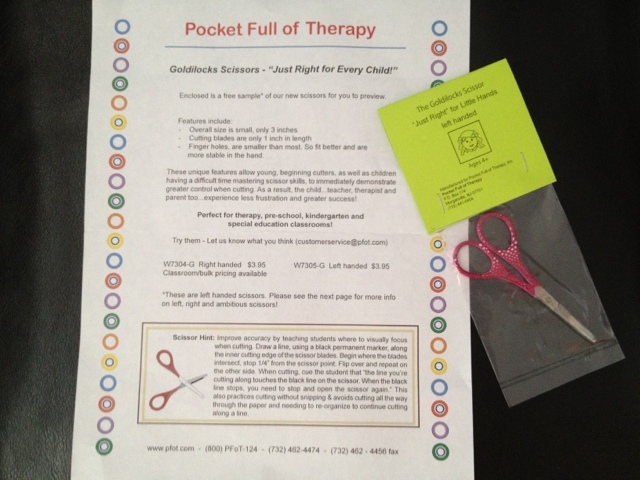 Pocket Full of Therapy very nicely sent me a sample of their "Goldilocks Scissor" for me to try out with my students. I was SUPER excited when they contacted me because I have a couple of students who still really struggle with fine motor. One student still needs a fat kindergarten pencil when he's 7 years old, and I thought he'd be the PERFECT test case for these scissors. Cutting has literally brought this child to tears this school year! Fine motor struggles are completely common in kids with autism and other disabilities. As teachers we find the best ways to make classroom tasks easier. 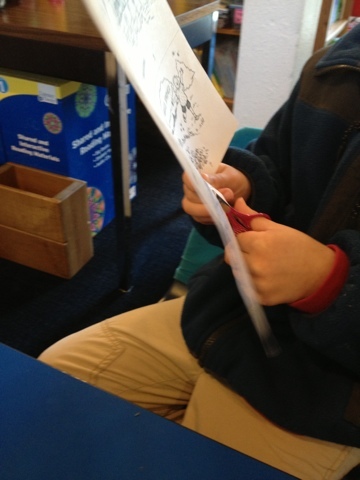 I've mastered pencil grips, and wiggle seats, but scissors and cutting are an area where my kids still have challenges. I was very excited to test out these little guys! 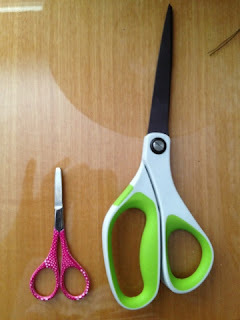 Below you will find a description of the differences between this scissor and a typical pair. 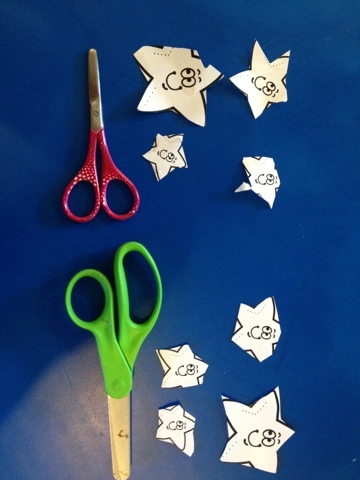 Then I have a comparison of the same shapes cut with typical kid scissors and then with the Goldilocks Scissor by the same child with significant fine motor delays. 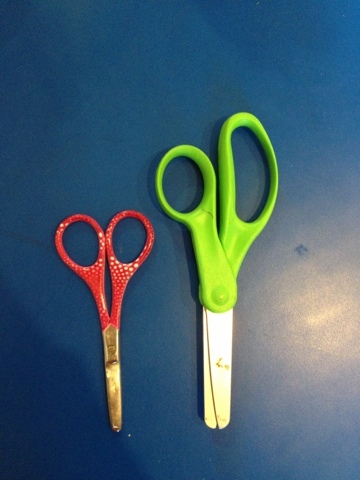 I was actually surprised at how much more my student liked using these tiny new scissors than his favorite green pair he uses every day! Forgive their dirtiness, they've had LOTS of use being his favorite! I should probably mention, I'm not being paid for this. I just got a sample pair of scissors and thought I should write a thoughtful review for my awesome readers who have students who could use these. 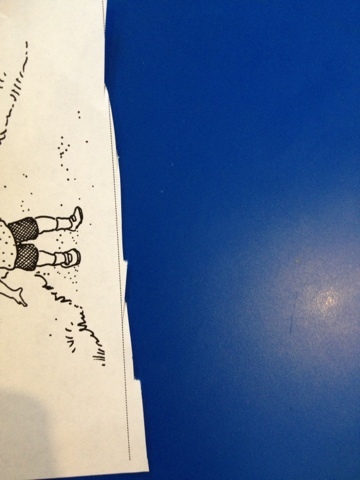 Here are a few pictures to show you the relative size. The green and white pair is my teacher scissor. These Goldilocks are super tiny! Only 3 inches! Don't let the small size deceive you though, these are powerful little scissors! They are sharp enough to cut paper rather quickly, but didn't cut my skin (I test all scissors for this before handing them to a kid!). They are very sturdy! They feel like they are metal all the way through with rubber sealing over the hand grips. No parts feel like they would ever break. Heavier than I expected for their small size, but definitely not too heavy for a kid to use for a long period of time. Just enough to be solid construction. 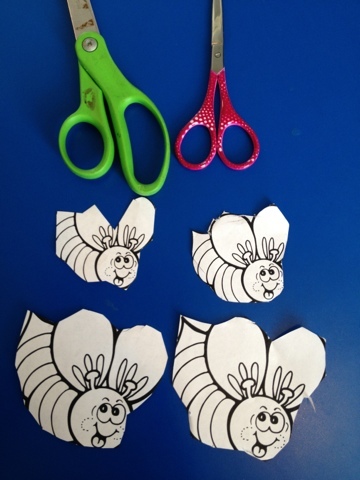 This is my student's first attempt at using these scissors compared to the same shape with his normal scissors. I had him start with a straight line and there was an instant difference!! 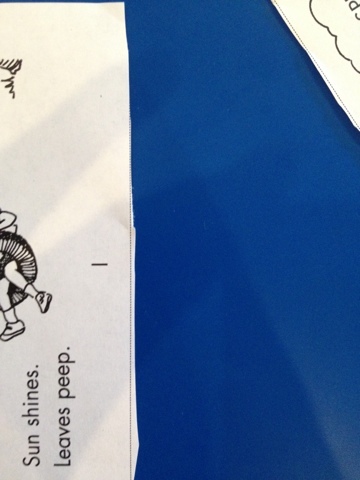 The line on the left was cut with his normal scissor, the one on the right was cut with the Goldilocks Scissor. Shape Cutting: These have subtle differences in pictures, but his ability to be comfortable cutting was noticeable when I was watching him. I tried them myself and they definitely feel/cut differently than regular scissors and may take some getting used to for the first couple of uses. Stars! I picked stars to practice his zig-zag cutting ability. There seemed to be a learning curve, so the difference is slight, but you'll notice the tips of the stars are cut off less with the Goldilocks. Here is his second shape: Bumble bees! He got used to the scissor and began cutting on/closer to the lines. He was also noticeably better at cutting on the curves for the smaller bee around the wings and around the belly of the big bee..
Super Helpful Tip!! I learned this from the very handy brochure they sent me: Draw a line on the inside of the blade with a black permanent marker up until 1/4 inch from the tip. Then have the student aim for putting the black line of the scissor to the line they are cutting and open the scissor back up once the black line stops. This was super helpful! My student learned not to snip the scissor all the way closed every time. I forgot the picture once I added the lines, but PFOT was nice enough to send me the image! It should go on the inside of the blade (where you don't see it when they are closed) and on the sharp edge. 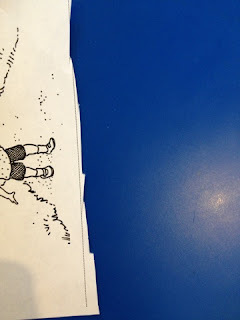 My student actually asks me to redraw the line as is wears off because he likes it so much! 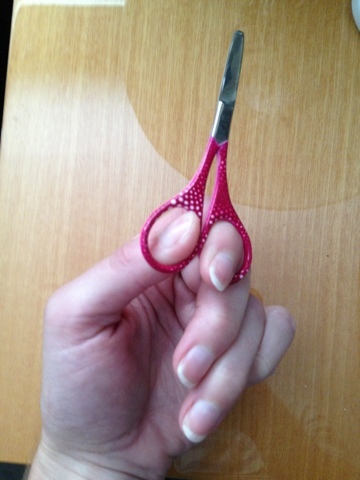 This scissor is $3.95, and can be purchased in bulk for less. It's only $7.50 for 3 pair! NOTE: There is a true left and right for these!! I can't cut with my right hand with these, but I can with my left (I'm right handed) so make sure you order the right pair. Just for fun! 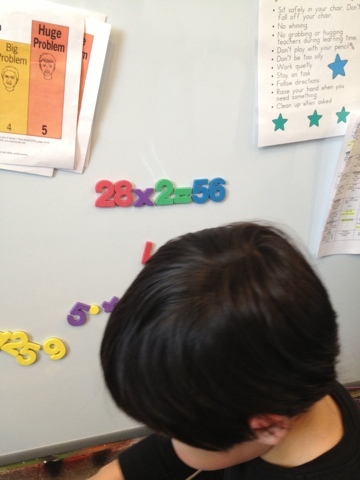 I took this pic of Genius Boy after I handed him magnets during free time. He did this problem...on his own...in his head... with complete logic that "times 2" means 28 twice!!!! This kid mesmerizes me! HE'S 5 YEARS OLD!!!! He knew the process correctly for multiple problems like this, so I used this time to teach him the notation when you write it out and carry the 1 and add it in the tens place after multiplying on the diagonal. He seemed to get it pretty quick actually. If this is kindergarten, what will 1st grade look like?! The Goldilocks Scissors-"just right" for every child! These are truly unique scissors, developed by an expert in the anatomy and fine motor development of the hand. Overall size is small, only 3 inches, and cutting blades are only 1 inch in length. 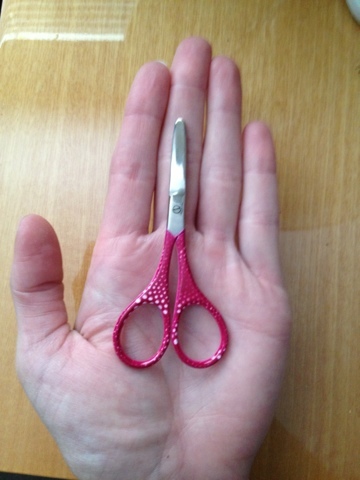 Much attention has been paid to the finger holes, which are smaller than those found on a standard child scissors. They fit better and are more stable in the hand. These unique features allow young, beginning cutters, as well as children having a difficult time mastering scissor skills, to immediately demonstrate greater control when cutting. As a result, the child...teacher and parent too...experience less frustration and greater success! Pocket full of therapy (PFOT) was established in 1989 by Michelle Tobias and Ilene Goldkopf. We are both Occupational Therapists specializing in pediatrics. The goal of PFOT has always been, and continues to be, to assist parents, teachers, therapists, and others obtain the unique toys and materials needed to facilitate effective, motivating and FUN, development and learning. PFOT offers a wide variety of products that address the foundational skills needed for learning and development. These include fine motor (including writing, dressing, strength and manipulation), gross motor (bilateral coordination, balance, motor planning), sensory (tactile, oral motor, vestibular), visual perception, critical thinking and more. Every child needs a firm foundation to build skills and develop upon. Our primary focus has been children with special needs or developmental delays. But the majority of our products are for any parent who wants their child playing with meaningful, worthwhile toys and for any kid who just wants to play with “cool stuff”! WOW! Seriously? Are those scissors sprinkled with magic? We use the scissors that have the little spring in them but they don't work for everyone, I like these! Gotta get me a pair! Thank you for sharing. I am having a classroom photos linky party, I hope you can join me!